iac making of series: SPIDER! Organizing the equipment and finding the method is one thing, getting the actors to do the job is another. My wife said "there's a beautiful big spider web in our front garden. See how it shines in the street light". I did and it did. And there was the spider too, busily working on his construction. It occurred to me that I was being presented with an excellent filming opportunity. "Not a problem" I thought "I'll just flood the place with light and pick out the best camera angles" So out came my four 500 watt halogen lamps and what happened ? The spider disappeared like a frightened rabbit. It transpired that lighting was to be the major hurdle in this whole enterprise. 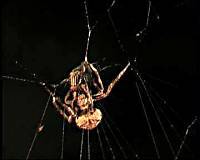 I Googled 'spiders' to find out that these orb-weavers are night workers and shun the light of day. It became a constant battle to get enough light on to the subject for recording without sending him off home. I eventually found that two 12volt 50watt downlights angled and at a measured distance were acceptable to His Spidership although barely adequate for my purposes. My Canon XM1 was wide open and on maximum gain all the time. Many shots had to be 'doctored' in post production to make them presentable, i.e. sharpen image and increase colour saturation. Close-up shots were taken with a 10 diopter supplementary lens and extra close-ups with a combination totalling 15 diopters that did produce some image distortion (barrelling) . Really close-up shots (where the spider was nearly touching the lens) had to be made with a hand-held camera because of practical difficulties in using a tripod. It was impossible to avoid casting a shadow over the subject and I had to mount two small hand flashlights on the camera, pointing in from each side to (hopefully) illuminate the action. Focus also was a problem. Depth of field was so shallow and manual focus so difficult to adjust in the half-dark that I had to rely on auto focus. This in turn would revert to focussing on some background object whenever it felt inclined, so I had to add a plain black backdrop (noticeable in some shots) to avoid this happening. I had to find a steady supply of flies for the spider that could be stuck on to the web wherever and whenever I chose. I devised a fly catcher that I referred to as my 'Fly Recruitment Centre' I then attempted to indoctrinate my subjects in the manner of religious fundamentalists by promising them a better afterlife - perhaps to return as a bee or a wasp - if they sacrificed themselves for the advancement of my photography. Quite a few escaped my persuasion. 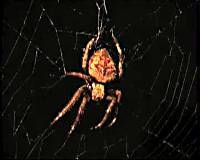 The time-period of gathering spider footage extended from early February to May. 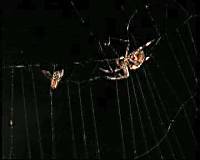 On any night, one false move with the lighting, or camera touching the web was enough to send the spider scurrying off for the night and there were many, many fruitless evenings. However over this period of time we got to know his habits rather well and he became known in our household as "Fred". The range of skills demonstrated by this tiny creature were simply amazing and we were sad when the cold winter weather came in the evenings and he no longer appeared. Read John's article on his Silver Award winner The Little Aeroplane - click here.